This finding is significant because the enzyme is in the same family (TET for ten-eleven translocation) of demethylases that trigger removal of DNA methylation from C in mammals. The function of TET enzymes, revealing that cells actively removed DNA methylation rather than just letting it slough off, was discovered only in 2009. From the point of view of the proteins that need to recognize it, methylation is really just a bump on a long DNA molecule, and that bump appears in a different context on adenine versus cytosine. Thus, it is striking that the enzymes that remove methylation are related in mammals and Drosophila. Yao is assistant professor of human genetics, and Jin is vice chair of research in the Department of Human Genetics. They published a paper last year in Nature Communications showing that N6-methyladenine is present in the mouse genome and its levels in brain cells change in response to stress. Another lab recently reported that in the human genome, DNA methylation on the letter A is extensive, if rare (1 in 2000 adenines), and reduced in cancer cells. The fly enzyme that removes N6-methyladenine is called DMAD (DNA N6-methyladenine demethylase). Flies with mutations eliminating the DMAD gene cannot survive early development. The Emory researchers created flies that shut off DMAD in the brain, which perturbed development of their mushroom bodies, involved in learning and memory. In fly DNA, N6-methyladenine is rare — 25 parts per million — but confined to certain parts of the genome. Eliminating DMAD in flies means N6-methyladenine abundance shoots up, and the purified DMAD protein can remove N6-methyladenine from DNA in a test tube. Jin says that one significant finding in the current paper is that Polycomb proteins, which repress gene transcription in both flies and humans, could be potential “readers” for N6-methyladenine. 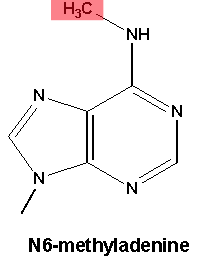 N6-methyladenine is present more often on DNA where Polycomb binds, and Polycomb prefers to bind DNA containing N6-methyladenine, the researchers showed. The research was supported by the National Institute of Neurological Disorders and Stroke (NS051630, NS079625, NS097206, NS091859), National Institute of Mental Health (MH102690), National Institute on Aging (AG052476), National Human Genome Research Institute (HG008935), March of Dimes and the Emory Genetics Discovery Fund.